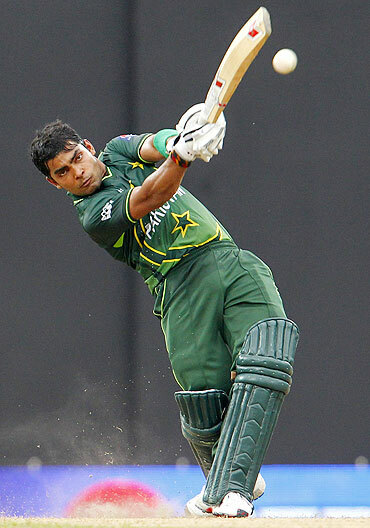 Pakistan's young batsman Umar Akmal has drawn flak from former players and critics for his below-par performance during the just-concluded tour of India. Even Pakistan's former captain Wasim Akram singled out Umar for criticism after the third and final One-dayer in Delhi on Sunday. "When will Umar learn to play responsibly? He has been around in international cricket now for a considerable time. He really needs to think about his game now," Wasim said. Umar, the younger brother of wicketkeeper Kamran Akmal, got out at a crucial time in the match with Pakistan chasing a low total of 167 set by India. Pakistan's former captain Rashid Latif was more forthright in his views about Umar and the match. "I think it is about time Umar is told by the selectors that he is not needed in the national team until he changes his approach and attitude towards the game," Latif said. "Umar has to be sent back to domestic cricket until the selectors see a visible change in his approach and attitude. He has got too many opportunities to realise his talent. But he is not finishing games," Latif said. Umar was also in the eye of the storm before the Indian tour when his department, Sui Gas, which includes Mohammad Hafeez and Misbah-ul-Haq, sidelined him after he missed some games in the President's Trophy tournament due to the wedding of his brother Adnan. Former Pakistan captain Moin Khan also felt that Umar was not doing justice to his enormous talent. "He is talented no doubt about it but he needs to learn that all this talent is useless until it results in good results for his team. He is just not showing the approach of a finisher which is sad," Moin said. Umar, who played in three matches on the Indian tour, is expected to be axed for the forthcoming South African tour as the selectors have more confidence in upcoming batsman Haris Sohail.